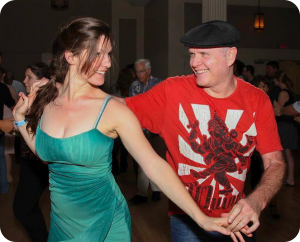 Richard has been a full time dance instructor since 1989, teaching Lindy, East and West Coast Swing, St. Louis Shag and Cajun Jitterbug. He started the Swing scene in North Carolina and is a founder of the Triangle Swing Dance Society . Besides local classes, he has taught workshops in Europe, Canada and Mexico, and at Duke University . Richard has been a Beantown regular, having missed only one previous week. In addition to dancing, Richard is an avid practitioner and instructor of Tai Chi.